My cardiologist said my surgeon recommends waiting 6 months after surgery for any dental work. Made it! Phew! It was pretty magical. The extraction only took about 10 minutes from when I sat down in the chair to when the tooth was out. Oh well. At least the tooth is out. And my oral surgeon said upper wisdom teeth are less likely to get dry socket because of the way the vascular system is positioned in the mouth. Hooray! That was an annoying 4 weeks. Glad it’s in the past. I had surgery on May 31st. I guess because November 31st doesn’t exist, that makes today 6 months post op. How is that even possible?!?! So there you go. Drugged up Debra still thinks fairly clear – however – the nurses, then the anesthesiologist, and later my surgeon thought it was hilarious. The anesthesiologist and the surgeon both asked to take a photo of my note. Apparently, in 30 years of work, no one had written one before. Which I found shocking. But then again, I was at a children’s hospital. Many of their patients can hardly read, let alone write. Here, six months later, things continue to go really well. I feel great. I have much more energy. Other than my hypothesis that my heart is smaller, therefore more efficient, therefore better circulation, therefore my wisdom tooth came in, everything is dandy. But seriously, my tooth (which I didn’t even know I had until my pre-op dental clearance appointment in the spring) came in and it came in quick. 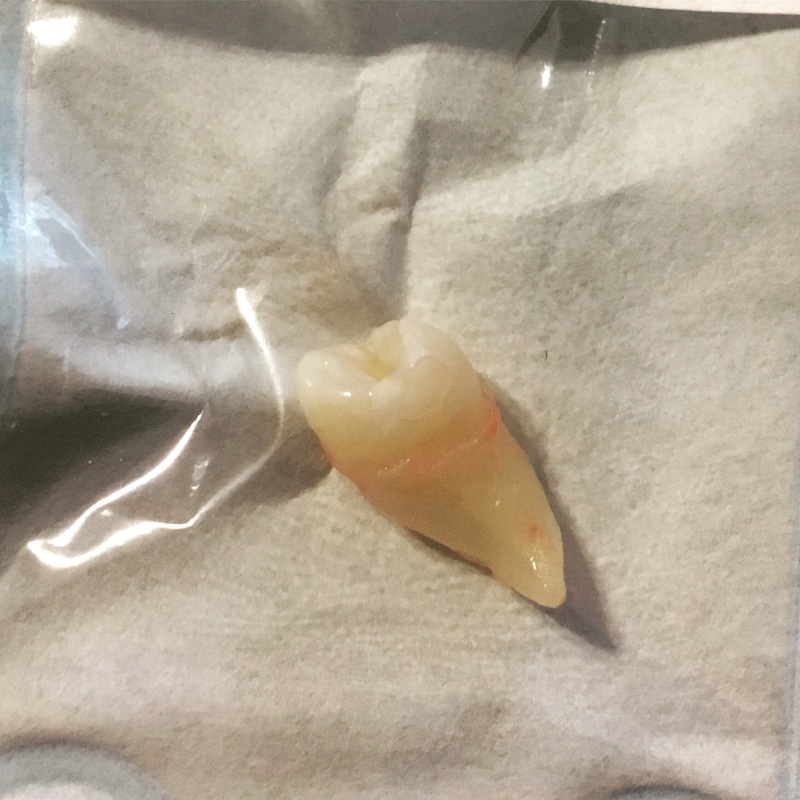 In the spring I was told “It may come in, in a year, in several, maybe never.” When I went to the oral surgeon at the end of October, one little edge had cut through the gum. They said “Oh – At your age? It will probably be a very slow eruption. It could sit right there for years and make hardly any progress at all.” UHM!!! 4 weeks later the entire tooth has come in. It does make my face hurt a bit but – hey – it’s not heart surgery so I can’t complain too much. I’m having it pulled on December 8th. Can’t wait. I’m tired of trying to brush it way back there. Beyond health stuff are enjoying the Advent season. We decorated and turned on the music the day after Thanksgiving. I have a few fun things planned for the boys, baking and such. I’ll leave you with a picture of our Christmas tree and nativity. We’ve made it one month. 🙂 We are quite enjoying this new phase of life and adventure of being married. As we head into the Christmas week (which has completely snuck up on us!) we are continuing to putts around the house, organizing, throwing things out, combining, cleaning, and getting settled into our Home. We are also wrapping up loose ends on wedding things, like pictures and thank you notes (I addressed 135 envelopes today.) I get the week between Christmas and new years off, so hopefully those extra days will help us get a little more accomplished, but also have some time of rest. Other than that – I’ve finally picked up War & Peace again. See 5 years ago… or again 3 years ago… This time I am already 150 pages in (about 1 / 10 of the way through) and I am finding it quite enjoyable. With the holiday’s that means less time at work, More time to READ! I finally read the Silmarillion by J.R.R. Tolkien. I have wanted to read this book for the last 5 years or so. I started it last January, but did not get very far before life got in the way. So I started over this weekend and read the entire thing. It’s so beautiful! And what a great backdrop to better understand the world of Middle Earth. Thanks Vicky for reminding me that I wanted/needed to read this. Hope everyone has a wonderful Christmas. We just finished opening gifts and we tried something new this year: Online video conferencing for all the family members. I received some nice puzzles, great clothes, a Christmas towel to decorate my kitchen, a bath set and a gift certificate for itunes. I can’t wait to pick out more music to listen to….perhaps some more Death Cab for Cutie!?!? I have been hanging out at Lance & Katie’s so it was really fun to see the excitement in the girls eyes last night waiting for Santa. And then again this morning as Santa left them a gift and ate the cookies they left out. So now it’s time for naps before the yummy christmas meal.